Dan Bull stories at Techdirt. 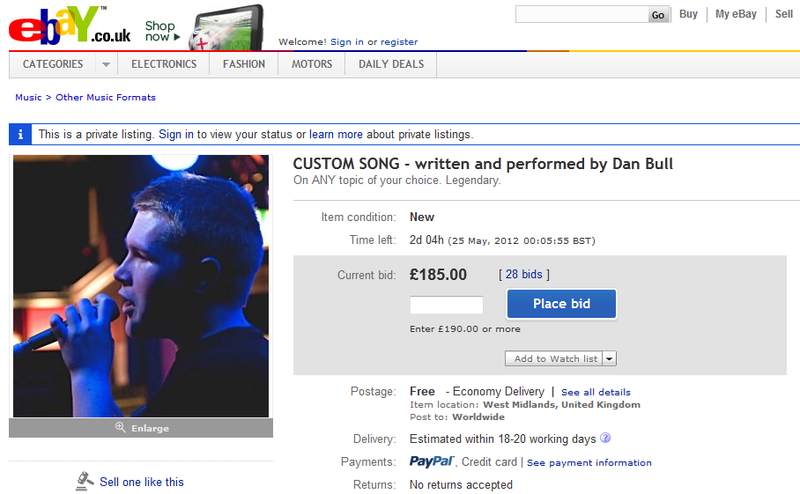 stories filed under: "dan bull"
I AM SELLING MYSELF ON EBAY. If you're the winning bidder, I''ll record a custom song on any topic you choose. The song will be awesome. Click and bid now. * Something ridiculously challenging just to show that I can do it. If I like the topic, I may make a video for it too and it will get tens of thousands of views at the very least. You can see the auction here, where the bidding is going fast and furious. I'm sure it helps that he's built up a larger and larger audience over the past year since he last ran this experiment... What I love about experiments like this is that it's not just about doing the same thing that others are doing, but finding what works with your audience, and knowing that if you can build up a strong fanbase, they'll be happy to support you doing cool things. Last week we wrote about the UK High Court ordering ISPs to start blocking The Pirate Bay just about the same time that UK musician Dan Bull had successfully used TPB as a promotional platform to launch him onto the UK charts. The first comment on that post, by Duke raised an interesting point: the court made this ruling despite the lack of any trial. This isn't much of an expansion, Newzbin2 was ordered blocked last year, but it is a major step. The big problem here is the lack of any sort of trial. While there was a ruling back in February, declaring that the operators and users of The Pirate Bay were probably infringing copyright, the ISPs didn't try to make a case (for fear of massive costs orders), and the Pirate Bay was given no opportunity to argue anything. As for today's order, looking through the Court listings, there wasn't even a hearing, so it was probably all done through written applications. This highlights how judicial oversight alone isn't enough (in a common law system) to ensure justice is done. Without an adversary to challenge the claimants (record companies), none of the possible defences, or issues (such as proportionality, anti-competitive practices, or negative consequences on people like Dan Bull) can be raised. Whether the end result is right or not, it's not justice when a few companies can have a website blocked, with no one from the website or elsewhere in a position to challenge or question it. This is a pretty key point that has received very little attention compared to the general order to block the site. I'm curious if folks in the UK can explain how this is defensible? While I recognize that free speech rights aren't as well respected in the UK, ordering ISPs to block a website without even allowing for any adversarial hearing seems like a pretty huge violation of basic concepts of due process. With Newzbin2 getting censored in the UK, BPI -- basically, the UK wing of the RIAA -- has been looking to have courts order many more sites blocked, with The Pirate Bay being target number one. Dan Bull, the UK-based musician who we've written about many times for his consistently awesome songs about the music industry, file sharing, copyright laws and the like has now put together another wonderful song, called Bye Bye BPI. You can watch it here: Like his SOPA Cabana song, Dan had a bunch of his Facebook followers participate in the video by taking pictures of themselves with the various lyrics. This time, since the song is about why musicians don't need (and don't want) the BPI, he sought out musicians to take part in the video, so everyone you see is a musician who doesn't need BPI. Yes, they're mostly amateur musicians, but the point of the video is that it's misleading to suggest that BPI supports musicians. It supports a tiny percentage of musicians. The rest get along just fine without, and wish that it wouldn't muck around with the technology everyone else uses. Oh yeah. It's also worth noting that Dan's got a new album coming out, which (of course) you can download for free. You can also buy it to show that you support the artists you like. * Bonus points if you can spot our own Leigh Beadon in the video somewhere. 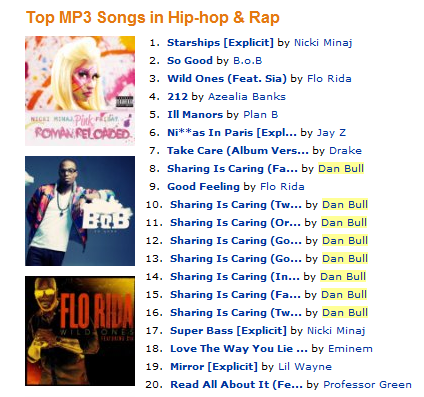 Independent musician Dan Bull, who we've written about a number of times, is one of many independent artists who used Megaupload on purpose, to distribute his own album. All of the links out there to download his album -- which he wanted -- point to Megaupload. And, unfortunately, they now all point to nowhere, because the US government used questionable reasoning to completely shutter the site. So Dan did what Dan does best... he wrote and recorded a song and video about it. Check it out below: My favorite line? "Make money giving away things for free? Ah! Why can't the majors do similarly?" It's a key point. As we explained on Friday, tons of artists have figured out that Megaupload and similar sites are a fantastic new business model, but they're a business model that the major labels hate... so they work double-time to make it look like some evil conspiracy. If anyone in the US government actually bothered to understand how music is distributed, marketed and monetized today, they would have realized that Megaupload isn't the problem -- it's one way to make things better for artists. But, as we know, the folks in the US government only get their information from the RIAA. So they end up making life much more difficult for indie artists by shutting down useful services for those artists. And, in the end, that is exactly what the RIAA wants.